There’s nothing noble about using poison. A weapon of the weak and powerless, it requires no skill at arms, no mastery of magic to use. With a vial of poison, anyone can end a line of kings or snuff out the ambitions of the most powerful wizard, or eliminate a key figure to bring a cult to its knees or disrupt trade across an entire region. Unsurprisingly, poison is feared throughout the Empire and beyond, and its use is forbidden in almost all civilized lands. To deal in poisons, to brew them, or to deploy them risks death, often by the most painful means. Despite their deserved reputation, though, poison experts remain in high demand in the very same places where the trade has been forbidden. There’s always someone in need of killing, and alchemists, assassins, poisoners, and other practitioners of dangerous arts command high fees for their invaluable aid. Few people in the trade deal with their clients directly lest they be exposed, which would endanger their work, other customers, and most likely, their lives. Thus, they work through intermediaries who handle transactions or vet clients’ identities to ensure no intent toward the employer. Do We Not Die? explores the sordid trade in poison in the black markets and seedy underworld of the Empire, offering an assortment of diabolical substances of mundane and magical origin, along with new spells that create and employ poison. 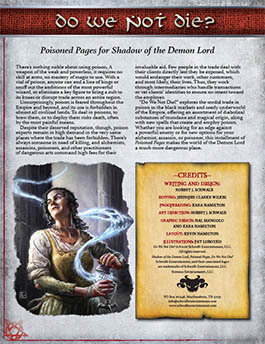 Whether you are looking for an edge against a powerful enemy or for new options for your alchemist, assassin, or poisoner, this installment of Poisoned Pages makes the world of the Demon Lord a much more dangerous place. Buy Do We Not Die? in PDF from Schwalb Entertainment or DriveThruRPG today!